My journey began not as a journey, but rather as a few short walks in the woods. I wanted to write some ‘real life’ short stories, fun, easy stuff. Poetry and personal auto-biographical musings followed as a means of self-expression. I never made the decision to ‘become a writer,’ I just became one. Bits of a story had been rumbling around in my mind and one day I sat down and wrote the first chapter of Relentless, then the next, then the next. That was it. The experience was exciting, free flowing, wholly creative and I wanted to keep going, Seeing Double came next. What has your former career as a psychotherapist helping adult survivors of childhood trauma brought to your writing? As a psychotherapist, my patients and their life experiences are always with me. Through my work, my insight, empathy and sensitivities deepened along with a strong need to advocate for the underdog. My love of intrigue combines with my commitment to social justice, as my characters reveal their experiences, inner dialogues and instinct for survival. Patients ‘pop up’ here and there throughout my books, showing up as character’s conflicts, fears, confusion, body language and vulnerabilities unfold. Where did the inspiration for the story line in Seeing Double come from? And the book's many characters? Seeing Double is a product of my imagination, evolving incrementally! 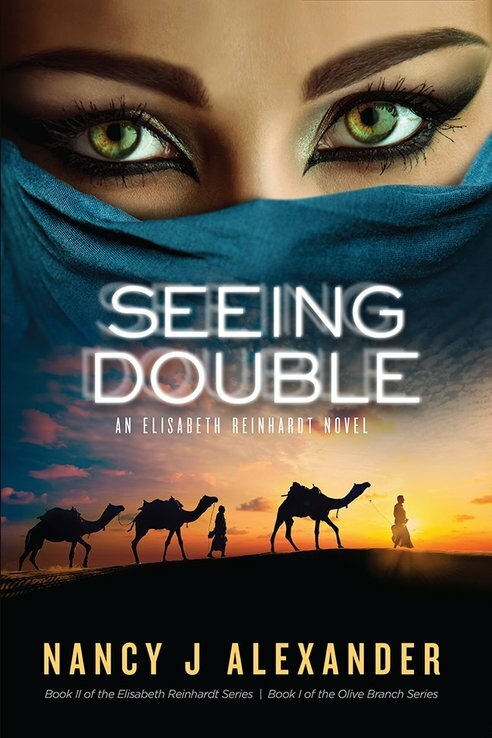 My interest in sociology, religion, culture, geopolitical conflicts and terrorism all led to the creation of Seeing Double. 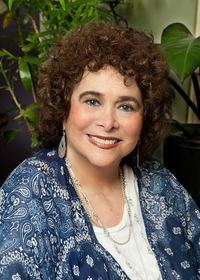 From the first page when Ari enters Dr. Reinhardt’s office, a novel focusing on the Middle East was born and a new spy series The Olive Branch, was launched. Personally, I have a connection with the state of Israel and a deep concern for all the people in that long suffering region. Palestinians, Syrians, and Iraqis, to name a few, suffer daily because of the so far unresolvable conflicts in their part of the world. Giving voice to entrenched over-arching issues preventing peaceful resolution was a personal goal, as characters were created to voice their daily struggles, dilemmas, conflicting nationalistic and religious forces. What kind of research/travel did you need to do to bring authenticity to the diverse locations and cultures included? Years ago I traveled abroad, so I have a narrow experiential sense of some of the lands, cultures and people. 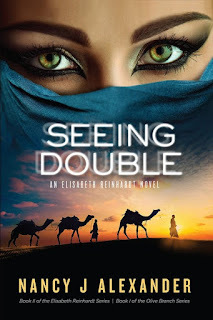 I think though that most of the richness that brings authenticity to Seeing Double comes from extensive research I did using books, google, news articles and interviews with people who had knowledge of the subject matter I addressed. This was quite a complex story with many, many threads and characters to introduce at the start of the book. How did you map it all out so that it flowed easily? You are quite right! Seeing Double is complex and multi-layered and I appreciate your observation about its flow. My writing process is spontaneous and character driven; I write without notes or overall map, relying on memory and an internal sense of the book’s direction. Rather than knowing where the book is going I sense it and allow it to evolve on its own. I write for long periods of time which contributes to the flow and intensity. After a break perhaps of several days, I skim through recent chapters, keying into the themes and issues. My deliberately designed chapter headings serve as content guideposts and often dictate the movement in each chapter. In addition, I’ll print and post index cards with pictures and text to serve as reminders. Once the novel is written, I re-read/rewrite and depend on my editor’s feedback to round things out. How do your organize your time when working on a new book? Research? Working on Manuscript? Pre-marketing? Writing is one of several projects demanding my time, so I don’t write every day. When I work on a book, I write intensively, for an extended period of time, often writing non-stop for 8 + hours. By the end of a weekend, a large portion of the book is completed. I do research online while I’m writing, often I’ll use my desktop and laptop side by side, one for research or supportive documents and the other for the novel itself. I usually have several documents open at once, moving material back and forth between them. Reading and ongoing topic research occurs intermittently. I would describe my process as free-flowing, intuitive and loosely structured. While writing my third novel, Twisted Realms, I started to use a software program called Scrivener which provides an excellent database, but I don’t write directly in the application because its word processing component is not as good as Word. Nevertheless, it’s a very useful writing tool, once the data is loaded. I may keep Scrivener open on my laptop to look things up while writing on the desktop. I love the initial process of creating a new story, inventing and describing my characters, their personalities, their idiosyncrasies, their relationships. I love getting ‘into their heads’ and letting the plots build naturally and incrementally. I love words. I love discovering just the right word for each situation and I love visualizing, watching scenes flourish and come to life. When a complex plot with all its strands and nuances comes together its pure joy. Sometimes it happens without my awareness, suddenly disparate plot points have merged almost magically. At other times, its work, going back and re-working sections to make things line up and make sense. That’s where the ‘chore’ comes in. Making the chronology of events line up, that’s work. That happens with re-writes and editing and that’s not nearly as much fun as uninhibited writing. What advice can you give authors just starting out who would like to write books in this type of genre? Spy novels are a lot of work, especially for those of us who aren’t spies! Not only are you writing a complex, intertwining probably multi-national plot but you’re writing about organizations that are by definition, cloaked in secrecy. Because of that, make peace with the fact that you are writing pure fiction and don’t worry too much about getting the spy thing right. Another aspect to consider is that you will be writing, in all likelihood about many different countries, cities, cultures, governments and organizations so there’s a lot to learn. I’d say to make sure there is something about the plot, setting or characters that you do already know or have a strong interest in studying. Do some reading in the genre to get a sense of how those novels are constructed; acquaint yourself with the locations you are going to be including. Get maps and globes and surround yourself with material so you can refer to things you need at a moment’s notice. You don’t want to break your flow by having to stop what you’re doing and read a book. Organizing your computer files is essential, so make sure your categories are clear and you know where you filed your documents!